Are you looking for a kill bamboo alternative method? Looking for a way for control or containing your bamboos? Bamboos can sometimes be the target of bad press. This is all too often due to lack of knowledge about the running and clumping types of bamboos, the plants get planted in the wrong place, or the wrong species for the requirements has been chosen. It's a shame that people have to resort to killing bamboos but these plants can become incredibly invasive and throw shoots up several feet away from the main clump. This can come as a big shock and if you don't know what to do about it you may resort to a method of killing it off altogether. If not dealt with the rhizomes just become stronger until it is a mammoth task to stop the spread. So here are some alternatives! If you have a bamboo hedge or screen that sends runners and shoots out beyond it's area of containment, don't panic! Mow the new shoots or cut/snap the shoots off as soon as you see them appear from the ground, while they are still young. If you cut off the shoot the energy goes back to the main plant/clump and the method keeps the spread under control. The only thing that can go wrong is that the new shoots are left too long before being cut off. However, even long shoots/canes can be cut to the ground, or slightly under the soil if they are growing up through a lawn, and then just mow the lawn as usual. Basically, the shoots can't survive if you keep cutting them off in the same way as you keep mowing your lawn. This image shows regrowth of 15ft bamboo that was cut to the ground one year ago. As you can see it has grown weaker shoots and is ready for cutting back again to prevent it growing to out of control proportions in future years. Alternatively, you can maintain this weaker growth as a ground cover if you keep it pruned. 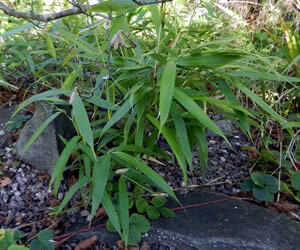 In this instance the bamboo has grown through gravel in a rockery and I quite like it so I will only keep it trimmed as groundcover and to prevent it growing to full strength or spreading too far. If your bamboos are running in the wrong direction, instead of resorting to killing the plant, try redirecting the growth. I've discovered that the rhizomes will not grow into air and will not cross a ditch. If the runner reaches air it turns in order to stay under ground. As a kill bamboo alternative, I have bamboos growing on top of banks. It only grows along the bank because of it's shallow root system. It is prevented from running sideways because there isn't any soil! A similar effect can be achieved by digging a shallow trench next to a hedge of bamboos. It doesn't have to be very deep, a spade depth is good. Ok.... imagine that the main plant is driving you insane... you don't like it.... it wasn't you that planted it in the first place.... and even though you do like the species of this particular plant, if it is an ornamental variety for example, you just don't want to maintain it with all this mowing and trimming! Dig up a bit of the root clump and keep it in a container! That way, you can happily go about killing the main plant but be left with a smaller version that you can move around the garden at your leisure, and keep under control. Video of dividing a clumping bamboo to prevent the plant from escaping through a fence.